For months I've been trying to get a Sales journal report. All I seem to get is either too detailed (by items), or too summary (sum by customer). I need a list of invoices by class. Basically a report by class showing CLASS, Inv #, Inv DATE, CUSTOMER NAME, Inv TOTAL AMT). All I seem to get is either too detailed (by items), or too summary (sum by customer). I haven't been able to figure out how. For now, I'm extracting this info from a GL data dump but I have to use lots of code and work around. Is there such a report? You can refer SalesByCustomerDetail for the required details. Please refer below sample query for the same. You can find most of QuickBooks report using above link. You can change report parameters as per your requirement. 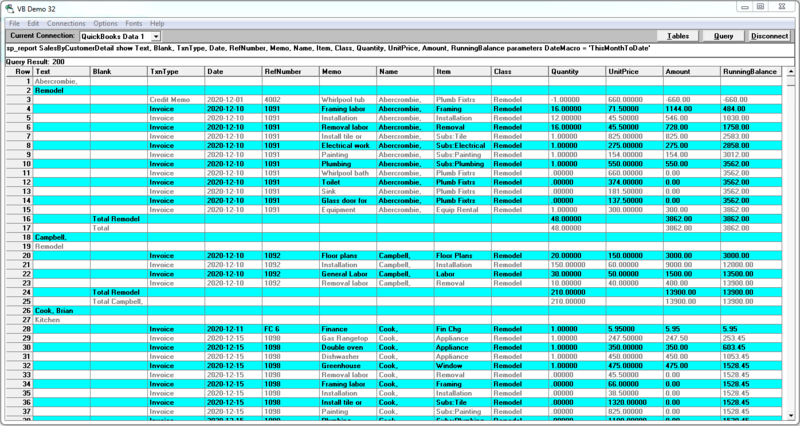 Also Refer QODBC table & report schema site to get details about each report column, parameters which are supported.